There can be no doubt that the ongoing crisis in Syria is the worst humanitarian catastrophe of the 21st century. The country has been the site of unprecedented destruction and displacement since the Syrian revolution began in March 2011, with peaceful demonstrations demanding radical political reforms. Over 400,000 people have been killed according to UN statistics; nearly seven million Syrians have been made refugees and another six million are internally displaced. More than thirteen million people, including six million children, are in need of assistance. At the end of 2017, over half of the country’s hospitals, clinics, and primary healthcare centers were either operating only at partial capacity or had been damaged beyond repair. Syria was discussed over 33 times by the United Nations Security Council (UNSC) in 2017; and it is the most frequent topic of discussion in unofficial talks. Since 2012, the UNSC has adopted 23 resolutions wholly or largely related to Syria. Russia has used its veto 13 times to prevent condemnation of the Syrian regime or an investigation by the International Criminal Court (ICC) into war crimes and crimes against humanity in Syria. The United Nations General Assembly (UNGA), where there is no veto, has issued seven resolutions on human rights in Syria. This is extremely rare, as member states are typically reluctant to condemn one another politically in the UNGA. Yet the magnitude of the human rights atrocities committed in the country since 2011 has induced states to speak out in one voice against these violations. As the Syrian government’s wide-scale practices of extrajudicial killing, torture, and repression of peaceful dissidents continues, the UNGA has taken to annually issuing a resolution that strongly condemns the continued use of heavy weapons and aerial bombardments by the Syrian authorities against the Syrian population.In July 2012, the state regime under Bashar al-Assad began using aircraft to drop barrel bombs on civilians, the most extensive aerial bombardment of civilians in a civil war. I will not go into detail regarding the Syria resolutions issued by the UN Human Rights Council (HRC), which now number 25, the first one issued in April 2011. Of course, the Syrian authorities have not allowed the HRC to enter Syrian territory. Citing the report of the commission of inquiry, which found that “gross and systematic violations of human rights have been committed by the Syrian authorities and members of the Syrian military and security forces in different locations in the Syrian Arab Republic since March 2011 that may amount to crimes against humanity,” the Geneva-based HRC formed an independent international commission of inquiry. Headed by Brazilian Paulo Sérgio Pinheiro, the commission has thus far issued more than twelve reports documenting war crimes and crimes against humanity in Syria. The Syrian revolution has passed through five main stages. 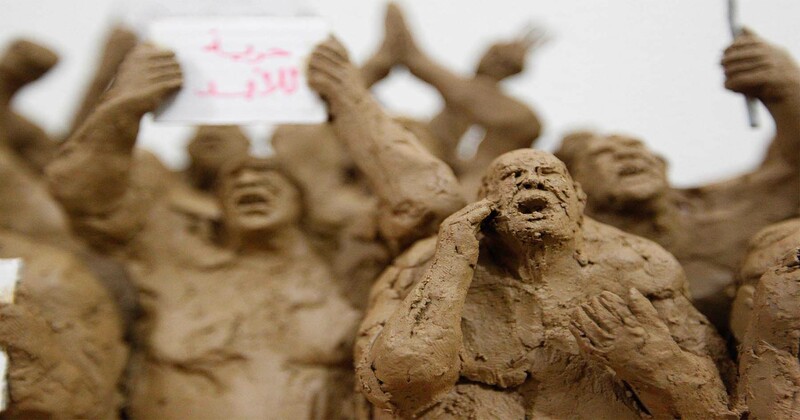 The first phase began with peaceful demonstrations demanding the ouster of President Bashar al-Assad and radical changes to the political system, including presidential and parliamentary elections and amendments to the 2012 constitution to allow political and party pluralism. The regime responded to the peaceful demonstrations – then entering their second week in March 2011- with lethal violence; seeking not merely to disperse protestors, but to kill as many as possible with the goal of intimidating them. For this reason, demonstrators were shot in the heart or head, according to a report from Human Rights Watch. More than 6,300 peaceful activists were killed from March 2011 to September 2011, in an attempt to completely quell the Syrian uprising.This spurred international organizations, particularly the Arab League, to take action to find a political solution. Organizations sent observers to persuade the regime to refrain from shooting demonstrators, allow peaceful protests, and release political prisoners. In this initial phase, the Syrian revolution was widely supported. Arab rights organizations put the wide-scale human rights violations of Syrians on their agenda. In particular, a kind of Arab rights front took shape that aimed to put human rights at the center of the political transition process, which was then the source of great conflict in nearly all Arab Spring states, starting with Tunisia and including Egypt, Libya, Yemen, and Syria. At the beginning of the Arab Spring uprisings, a type of solidarity developed among various protest movements, and this was reflected in the solidarity of Arab rights organizations. This solidarity was expressed in statements that closely monitored the rights situation and positions registering rights objections or solidarity, all of which played a major role in the formation of an Arab rights front. Nearly all the Arab revolutions began in a similar way, as popular uprisings without political or ideological leaders. The principled stances taken on respect for human rights values seemed central and non-negotiable. The rare consensus that existed at least between 2011 and 2013 was perhaps a measure of the success of the Arab rights movement since the 1980s in making human rights a central Arab policy issue in the domestic, regional, and international arenas. Pioneering rights groups like the Cairo Institute for Human Rights Studies (CIHRS) and the International Federation for Human Rights (FIDH), along with local Syrian organizations, which proliferated, contributed to this effort. These groups focused on documenting and publicizing all types of human rights violations. In this, they were aided by modern technology and social media, which helped them to expose violations on a broad scale. A focus on the media further made human rights an Arab political priority. Due to all this, the rights and dignity of citizens and the exposure of torture became the closest thing to a real national agenda whereas previously these issues had been of concern only to elite rights organizations. Unfortunately, neither Arab nor Syrian rights organizations were able to create a coherent, coordinated rights caucus that could build on the vast interest in such issues generated by the Arab revolutions. Disagreements within rights organizations in this period became more open due to personal disagreements or the different ideological commitments of people working in them. Nevertheless, the magnitude of flagrant violations committed in Syria made such disagreements secondary and relatively unimportant. The second phase of the Syrian revolution came as it turned to violence, or what some called the armed revolution. Several factors contributed to this shift from peaceful to violent rebellion. Firstly, the outbreak of the Libyan revolution, the spread of arms, and the NATO Libya intervention made Syrians hopeful that similar assistance could help them bring down the Assad regime. Secondly, the regime killed, imprisoned, or denied medical treatment for injuries to mass numbers of peaceful demonstrators and anyone involved in peaceful action. The most prominent of such cases were the killing of activist Ghayath Matar, who had the idea of giving flowers to security personnel during demonstrations as a message of peace, and the torture of the child Hamza al-Khatib, Tamer al-Sharie, and others. Thirdly, huge numbers of peaceful activists were tortured in Syrian prisons, many of whom died as a result. All of these factors led Syrians to take up arms in late 2011. At this point, the disagreements among Arab rights organizations and their different stances on human rights violations became apparent. Although the Syrian regime escalated its violations to unprecedented levels and began using heavy weaponry indiscriminately against civilians, as well as aerial bombardment and barrel bombs, Arab rights organizations began to be more circumspect or even silent about such violations. The Syrian opposition began increasingly calling for the protection of civilians under the principle of the Responsibility to Protect (R2P), which had motivated UNSC Resolution 1973 in Libya sanctioning NATO military intervention to protect civilians after Qaddafi threatened air strikes against civilian populations. Many Arab rights organizations expressed serious reservations about such appeals. Even international groups like Amnesty International and Human Rights Watch maintained a purely rights-based approach, documenting violations that had already taken place, and did not develop a preventive strategy to deter these violations and crimes in the future. This principle of ‘never again’ is at the heart of R2P—the idea that such crimes should not be allowed to recur before our very eyes. These organizations rejected all appeals to forge an international strategy to prevent the recurrence of crimes against humanity, which the Syrian regime was daily committing in the form of mass extrajudicial killing, torture, indiscriminate bombardment of civilians, enforced disappearance, and other acts classified as crimes against humanity under the Rome Statute of the ICC. The role of international organizations seemed to be limited to documenting these violations while Arab organizations—in Tunisia, Morocco, and Jordan—remained silent or rejected calls for international intervention to protect civilians. These organizations refrained from taking a clear position on the violations committed by the Syrian regime in the previous two years—which led to the death of at least 100,000 people and the displacement of three million. Yet the same organizations took clear positions on violations thought to have been committed by the opposition or related to actions that may have targeted the Syrian regime, as observed by the Syrian Human Rights Committee. On May 9, 2013, 88 rights organizations and networks issued joint statements to stop the bloodshed in Syrian streets. In this and other similar statements, the passive voice was used to avoid naming the ultimate cause of the casualties and massive violations. The third phase was the full militarization of the Syrian revolution, which came with growing defections from the Syrian army. This phase also saw interventions by Russia and China in international platforms, including the UNSC, to protect the Assad regime. Russia used its veto on the council 13 times to forestall condemnations of the regime. This signaled to the regime that it enjoyed tacit international protection, spurring it to use air strikes. Starting in July 2012 and until today, the Syrian regime has made frequent use of air bombardments, in particular using barrel bombs. These bombs—a metal box containing a piece of iron and a huge quantity of flammable material that costs $8–10 to make—are dropped indiscriminately, which is a war crime under international humanitarian law. At this point, Arab rights organizations began condemning the “militarization” and the increased arming of civilians while remaining silent on crimes committed by the Assad regime. This phase also coincided with the rise of the so-called counterrevolutions regionally and stark polarization in Arab political life in general. This shift occurred due to several factors. Firstly, there was Sisi’s military coup in Egypt and the division it sowed among the Egyptian elite, including the rights elite, regarding their stance on the coup. This issue was particularly charged since then-President Mohammed Morsi was a member of the Muslim Brotherhood, a political Islamist movement whose positions on human rights were a source of concern. The Brotherhood’s stance on democracy as a political practice and the movement’s practices over decades in Egypt and in its other incarnations in Arab states like Syria, Libya, and Tunisia were also problematic for some rights organizations. In other words, taking a position on the June 30 movement of 2013 that culminated in Sisi’s military coup also required taking a position on the Muslim Brotherhood. The Arab rights movement is comprised of activists with diverse experiences and histories, from Arab nationalists, to leftists, to Islamists. This diversity was reflected in its stances on Sisi’s coup, which ranged from supportive to cautiously awaiting the policies that might result from the coup. Another factor for the shift is the failure of Arab rights activists to divorce themselves from their ideological backgrounds when evaluating political stances or events or rights violations. Their ideological commitments were thus connected in some shape or form to the expression of a domestic stance, thanks to the rising influence of political parties after the Arab Spring. A rights group that supported Sisi in his military coup would support a similar stance, or a similar coup, in its own country in order to get rid of the Islamist political movement there. The third phase of the Syrian revolution also witnessed the most horrific violations in Syria’s history. Barrel bombs were used systematically and extensively against civilian populations, and chemical weapons were deployed against civilians. This period also saw the rise of Islamist factions and terrorist organizations such as al-Qaeda and ISIS, which exploited the chaos in Syria to extend their influence and force Syrians to submit to their extremist ideologies. This led some Arab rights organizations to focus on the latter and support Bashar al-Assad instead of focusing primarily on the condemnation of war crimes and crimes against humanity committed relentlessly by the Assad regime against civilians. The Syrian revolution entered its fourth phase when the Assad regime began repeatedly using chemical weapons, as the opposition held and was able to liberate some regions in northern Syria and the Damascus environs (Rif Damascus). The regime used chemical weapons 31 times. In August 2013, more than 1,400 people, including 400 children, were killed in Eastern Ghouta in the most deadly chemical attack to date. The regime fired seven missiles fitted with chemical warheads into an entirely civilian area at around two in the morning, which substantially increased the casualties. The Assad regime’s use of chemical weapons on civilians occasioned a rift between Syrian rights organizations and their Arab peers. The accumulation of war crimes and crimes against humanity spurred Syrian rights groups to take more radical stances while Arab rights organizations took positions that at best can be described as purely political. They were silent or issued no statements about the regime’s use of chemical weapons, but quickly issued statements decrying the threat of force against the Assad regime when then-US President Obama threatened to respond to the chemical attack in Eastern Ghouta in August 2013. This confused stance rejects the use of force to protect civilians as a preventive measure but sharply responds to the threat of force rather than the act itself. President Obama ultimately did not use force in exchange for the Assad regime’s turning over of its chemical weapons, part of deal brokered by Russia to avert a potential military attack on Assad. These same organizations took the same stance when President Trump threatened to strike Assad in response to the use of chemical weapons in Idlib, but they held their tongue about the impact of the weapons on Syrian civilians. In my opinion, this irreparably damaged the credibility of these organizations in the Arab rights arena. On September 6, 2013, for example, 314 rights organizations issued a joint statement calling on the US Congress and the French parliament “not to pursue an attack on Syria in violation of international law.” The statement expressed appreciation for “the stance of the British House of Commons, which passed up the opportunity for Britain to join in the attack on Syria as it did in the Tripartite Aggression on Egypt in 1956, a position that is consistent with international law.” The statement further appreciated “the stance of the 77 members of the Jordanian parliament, and all similar Arab and Western movements, who called on the Jordanian government not to use Jordanian territory as a launching pad for attacks on Syria.” This action demonstrated the failure of these organizations to apply international standards and conventions related to human rights violations. Instead, they were largely motivated by ideology and occasionally sectarianism. The fifth and final phase of the Syrian revolution began in September 2015 when Russia intervened militarily on the side of the regime, with the goal of totally smashing the armed opposition, whatever the cost in civilian lives. This intention was amply demonstrated in the Russian-led military operation in Aleppo in December 2016 and then in Eastern Ghouta in 2017. The Russian defense minister has said there are 63,000 Russian soldiers in Syrian territory. At that point, the regime and opposition were in a deadlock, but the balance of power shifted with Russian intervention. Eastern Aleppo was taken by Iranian militias who made no distinction between civilians and combatants, killing indiscriminately, as did Russia. Nearly 35,000 Syrian civilians left the area to save their lives. Most of them sought refuge in Turkey, where more than four million Syrian refugees reside. The same series of events was repeated in other areas like Homs, Deraa, and Idlib. Thanks to this chaos, ISIS had taken shape in 2013, fighting the Syrian opposition and taking areas under its control. Ultimately controlling the largest territory in Syria and Iraq, it implemented a medieval system of rule inimical in particular to women and children’s rights and with no respect for basic rights, especially political rights. As ISIS began executing Western journalists and after it took Mosul in Iraq, a US-led international coalition took action to eliminate the group, but with no concern for events in Syria, where the Assad regime continued to target and kill civilians with all manner of conventional weaponry. Arab rights organizations avoided any mention of Russian violations. We could find not one statement from these organizations condemning human rights violations, war crimes, and crimes against humanity perpetrated by Russian forces in Syrian territory. Yet statements were issued increasingly frequently against Syrian “terrorist organizations,” for which the armed Syrian opposition was typically held responsible. While the armed opposition has certainly committed rights violations worthy of condemnation, they pale in comparison to the violations of the regime or Russian forces. This widened the cracks between Arab rights organizations, some of which had come to see only those human rights violations perpetrated by their political opponents, and thoroughly stripped them of any credibility. The Syria that we knew is gone; as a result of the war, Syria’s population has dropped from 23 million in 2011 to just 15 million today. The sole vision for a so-called political solution in Syria is the Geneva agreement, reached under the aegis of former UN Secretary-General Kofi Annan in October 2011. The agreement is based on the formation of a transitional government including both the regime and opposition, each with the right of veto, as well as the release of all political prisoners, authorization for peaceful demonstrations, and the relinquishment of heavy weaponry in cities. Events of the past seven years, however, have run in the opposite direction. Syria has become an arena for the commission of war crimes and crimes against humanity on a daily basis, according to the independent international commission of inquiry. Arab rights organizations have fallen victim to the political and ideological disputes that raged after 2013 between Islamists and secularists, who cannot agree on a minimum threshold of universal human rights values that must be defended regardless of the identity of the perpetrator or victim. All of this demonstrates that we still have a long road ahead of us before human rights values assume their rightful position at the center of Arab political discourse. UN news reports on Syria. World Health Organization, Syrian Arab Republic: Annual Report 2017, WHO Regional Office for the Eastern Mediterranean. UNGA Resolution 71/248 on the situation of human rights in the Syrian Arab Republic, January 11, 2017. All resolutions can be found on the documentation website of the Independent International Commission of Inquiry on the Syrian Arab Republic. Liz Sly, “Arab League announces peace plan for Syria,” Washington Post, November 2, 2011, Yasmine Saleh and Lin Nouehed, “Arab League proposes new plan for Syrian transition,” Reuters, January 22, 2012, . On September 17, 2013, CIHRS and the Euro-Mediterranean Human Rights Network, in concert with several Syrian organizations, presented an oral intervention to the HRC on the current atrocities in Syria. The CIHRS prioritized Syria in 2012 in its interventions to the HRC in Geneva. “Out of Sight, Out of Mind: Deaths in Detention in the Syrian Arab Republic,” report from the International Commission of Inquiry to the Human Rights Council, February 3, 2016, . Roy Gutman, “In Syria, ‘Never Again’ Has Become ‘Never Mind,’” Daily Beast, March 2, 2018, The Syrian opposition called for the establishment of safe zones starting in 2012 when the Assad regime stepped up its indiscriminate strikes at Syrian civilians. The question of a humanitarian intervention in Syrian has been discussed for the past seven years in light of increased civilian deaths and numbers of refugees. The principle of civilian protection is established by international legal principles articulated as R2P. Ghazi Hussein, “al-Qanun al-Dawli wa-l-Tadakhkhul al-Khariji fi Suriya,” al-Manar (channel financed by the Lebanese Hezbollah, whose militias have intervened in Syria in support of the Syrian regime), November 14, 2012. Report of the International Commission of Inquiry to the HRC, 36th session, September 11–29, 2017. It is difficult to impossible to find statements from Arab rights organizations on the criminal use of chemical weapons against civilians in Ghouta on August 21, 2013, which has since become a signal event in the conflict. A joint statement issued on September 6, 2013 condemned the use of chemical weapons in Syria “whatever the body that used them, whether in Khan al-Assal (March 2013) or Eastern Ghouta (August 2013) or elsewhere.” UN investigators called for continued investigation to expose the parties responsible for the use of chemical weapons. See the statement from the Syrian Human Rights Committee, September 25, 2013, op. cit. Syrian Human Rights Committee statement of September 25, 2013, op. cit. “Russia says over 63,000 troops have fought in Syria,” The National, August 22, 2018, . The Tunisian Human Rights League issued a statement on July 24, 2017 expressing its strong disappointment with the failure of a proposed resolution in the parliament calling for the restoration of diplomatic ties with Syria and the upgrading of diplomatic representation from the consulate to the embassy level. The statement said, “Though symbolic, the matter is indicative that there remain in the Tunisian parliament those who prioritize doctrine over the nation in contravention of the constitution.” The league expressed appreciation for the stance of several civic organizations calling for the restoration of ties between Syria and Tunisia, including the Tunisian General Labor Union. The league called on the higher Tunisian authorities to restore diplomatic ties with Syria in accordance with the right of peoples to self-determination, territorial unity, and territorial independence, saying that the Syrian people alone have the rights to manage their public affairs.